I love crocuses. They pop up all over the garden every February, bright and cheerful no matter what the weather might be doing. Our yellow crocuses come first, followed a week or two later by their paler, but no less beautiful purple cousins. Both serve as a reminder that spring is just around the corner, helping to bring a smile and a lighter step after the wet, dreary months of winter. Crocuses are reliable and utterly undemanding. I’ve been way too busy lately to do any cleanup or weeding, but nevertheless, these beautiful little flowers have emerged from the decay of last year’s garden, right on schedule. I won’t have to weed, deadhead, stake or prune them, and even if I never get around to sprinkling any compost or bone meal over them (which I’m sure I won’t), these hardy little delights will return again next year. Now if only all the other plants in our garden would be so cooperative, I’d have it made. A reminder: if you’re on Gabriola Island over the next month, I hope you’ll drop in to see my new photography show, “Afloat in the Salish Sea”. It’s at the Gabriola Community Health Centre (691 Church St.), open Mondays through Fridays, 8:30 am to noon, until March 30. 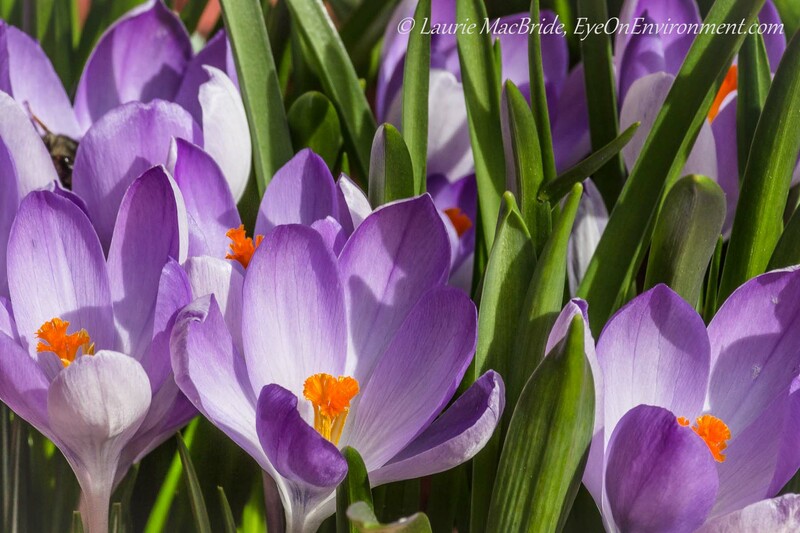 Posted by Laurie MacBride, Eye on Environment on February 25, 2015 in Garden and tagged colours, crocus, flowers, gardening, nature, photography, photos, plants, spring. 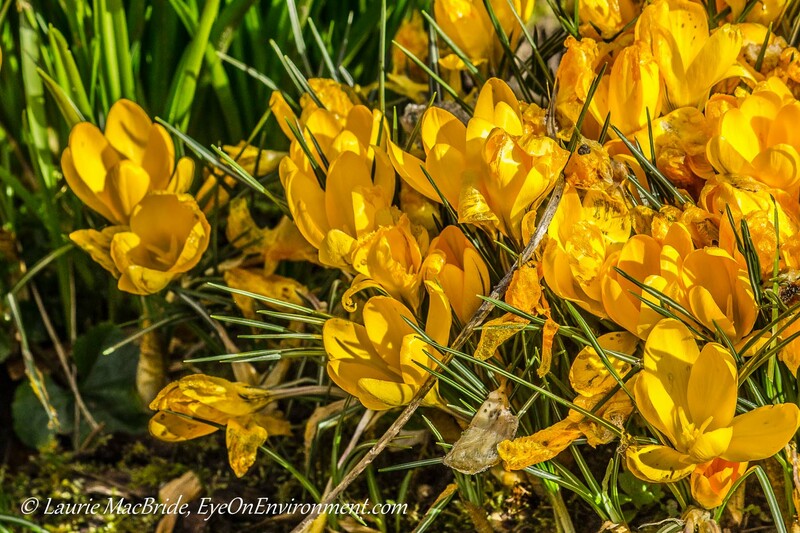 Your wonderful images provides so much hope that spring is on its way, it is around the corner. Thanks so much, Charlie! Though we likely still have a bit of winter to get through, the last few days it’s actually felt like spring is already here, for us – I only wish I could share such weather with people back east, who are having a horrid winter. Laurie, I just stopped by the medical centre to see your show, and I’m SO impressed! The detail is wonderful, and you have such a good eye. A funny moment–from the end of the room I saw what looked like the tentacle of an octopus…then as I got closer I realized it was actually drops of water on a branch. I had the feeling that if I examined each drop, I might see you and your camera reflected. Thanks so much for this, Rosemary! Very glad you had a chance to see the show, and that you like it.